As the number of students taking modern foreign languages at A level has gone into freefall, the government is putting in the region of £100 million into MFL schemes at key stage 2. Jim Donnelly looks at how this will impact on SHA members. Many secondary schools are already fully aware of the problems that have arisen since modern foreign languages have become optional at key stage 4. Implementing the compulsory requirement at key stage 4 was a headache for many but most schools were working their way steadily towards a MFL qualification for the majority of students when the change effectively put the trend into reverse. Figures from the examination boards substantiate what schools already know about the drop in the numbers of students taking a qualification (or even a course) in a MFL at key stage 4. Many MFL teachers now face the challenge of trying to teach year 9 students who have learned a limited amount of French or Spanish and who have no intention of studying it after age 14. The sense of déjà vu may be a little ironic to leadership teams who have fought to promote MFL study and to recruit teachers who are able to deliver it. One sign of the times is that a MFL vacancy locally attracted nearly 30 good applications, whereas the original holder of the post, appointed in 2001, was the sole applicant. At the same time as the government dropped compulsory MFL at key stage 4, it announced a major initiative for key stage 2. While the irony of this should raise some eyebrows, many MFL teachers feel that it is easier for children to learn a second language at age 7 than later, so the investment is not unwelcome. The government target is that all children will have the opportunity to study a MFL from year 3 by 2010. It is interesting to note that, for the moment anyway, a school can meet this requirement by having a lunchtime or after-school club. This announcement will have - and in many areas is already having - major implications for secondary schools. Although 2010 is the target date, many primary schools are already taking up this initiative with some enthusiasm. It is a further irony that many parents in this country now appear to value the study of a MFL, if the evidence of our primary colleagues is anything to judge by. All schools are required to provide the opportunity for children to study at least one modern foreign language from age 7 by 2010. A major initiative is under way in initial teacher training to ensure a pool of key stage 2 teachers qualified to teach MFL. Training is being provided for existing primary teachers to teach a MFL either to their own class or across the key stage. Support is being provided to extend the number of foreign language assistants available to schools. Language colleges are being encouraged to support key stage 2 teaching with the allocation of £30,000 from April 2006. This is not confined to key stage 2 and those receiving the money may need to make this clear to schools in both sectors. A substantial amount of money is being invested in developing the 'languages ladder'. Although many primary schools have taught languages in the past, there has been no consistent national scheme to accredit learning below GCSE level and to ensure progression for those learning a language before age 11. 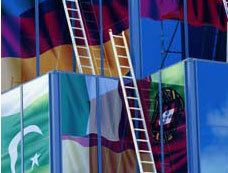 That is all set to change with the languages ladder, which went live in September 2005. There are 17 steps on this ladder and schools will be able to make awards on several rungs. Materials and training will be provided, at various costs, to enable primary schools to do this. However, the most significant part of the ladder is the external accreditation available at particular stages, which have been mapped against other accreditation schemes. This is set out in the table below. As part of the languages ladder, the recently-launched Asset Languages recognition scheme may be of interest to secondary schools, as it will provide an accreditation system for all. For example, it might be used to provide accreditation for all students at the end of key stage 3, including those who don't go on to key stage 4. At each level there are four distinct skills (listening, speaking, reading and writing) and they can be accredited separately; this is likely to prove significant. There are also performance table points against the ladder, ranging from 2.5 for breakthrough grade 1 to 13.75 for intermediate grade 9. Asset Language qualifications are designed as a measure of proficiency rather than to assess any particular programme of study. They should therefore be useful for various courses. The first languages to be made available are Chinese, French, German, Italian, Japanese, Punjabi, Spanish and Urdu, in breakthrough, preliminary and intermediate levels. More are being developed and should be available from September 2006. What are the repercussions for secondary schools? Some schools have already had to deal with the issues associated with teaching MFL to year 7 students who have studied it seriously at primary school. Although the students might not have a formal accreditation this year, their parents will still expect that they carry on at their own level and not start again with the basics. From September 2006, of course, some primary students will have formal accreditation. Indeed, once this accreditation is available it is likely that many primary schools will want to take advantage of it and this is likely to sharply increase the pressure on secondary schools to make proper provision for progression. As with earlier developments in the ICT area, some children will not have studied MFL at all in their primary school, but they will probably be the easiest group to deal with. Following on from this, some primary schools may concentrate on the development and accreditation of some skill areas to higher levels than others. Therefore some children may have reached breakthrough level in speaking and listening in a particular language but may not have been accredited in reading and writing. Secondary schools will need to know who has studied which skill and to which level. They will then need to provide the progression referred to above. Some primary schools have already introduced Spanish or French, in particular, in year 3. Those students will reach secondary schools in 2008 and they are likely to be very proficient indeed. Some of the MFL teaching at key stage 2 is excellent; this is good news but it does present a challenge. As if this is not enough to be thinking about, schools that do not take all their students from specific primary schools which have all agreed to teach the same MFLs will be faced with children who have studied French or Spanish or German or Chinese or a combination of several of these. A further concern will be the availability of suitably qualified teachers in a range of languages. Many schools offer one main language with possibly a second one. If the children arrive at the school speaking Spanish and the secondary school has specialists in French, this will have staffing implications. Although the recognition scheme is long overdue and very welcome to schools and MFL teachers, schools will still face additional costs in dealing with accreditation. This will put additional pressure on budgets that are already very stretched. In the long run, of course, the key stage 2 strategy may produce students who by the time of the London Olympics in 2012 will want to continue to study a MFL at key stage 4. Let us hope we have enough MFL teachers in secondary schools to cope when that happens. Jim Donnelly is head of Litherland High School, Sefton, Merseyside and is currently seconded part-time to the LEA as school projects' director for ICT, MFL and international links. Full details on Asset Languages are available from OCR at www.assetlanguages.org.uk. A pack has been sent to schools to explain the details of how it will operate.